Iraqi President Jalal Talabani, pictured in this file photo taken December 22, 2010, said leaders agreed on a U.S. training mission. Baghdad (CNN) -- Iraqi political leaders agreed early Wednesday that the Iraqi government will begin negotiating with U.S. officials about leaving U.S. forces inside Iraq -- beyond their scheduled departure at the end of the year -- on a training mission. The decision was reached after more than four hours of talks, which got under way at 9 p.m. Tuesday at the residence of President Jalal Talabani and wrapped up at 12:30 a.m. Wednesday. 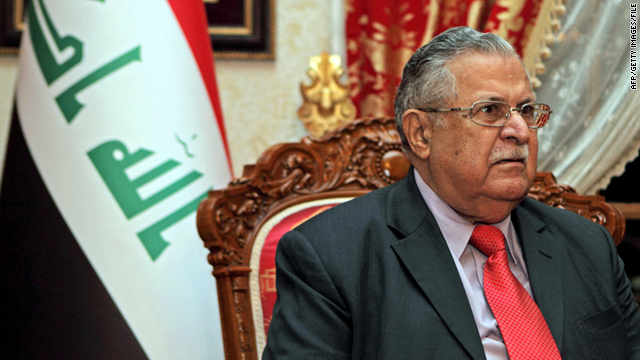 "All political leaders have agreed on the U.S training mission in Iraq except the Sadrists, who have some reservations," Talabani told reporters afterward. He was referring to supporters of anti-American Shiite cleric Muqtada al-Sadr, who once fought pitched battles with U.S. and Iraqi government troops. Al-Sadr himself has threatened to return to "armed resistance" if U.S. forces remain. "After extensive discussions, the leaders of the political blocs headed by Iraq's President Jalal Talabani have agreed to let the Iraqi government start negotiations with the American side only on the issues of training and under the Strategic Framework Agreement," Iraqi Deputy Prime Minister Ruz Nouri Shawees told reporters at the president's residence. "The Iraqi political leaders will be watching the talks to consider any final agreement with the U.S. side," he said. The leaders did not say how many U.S troops the government would need to train Iraqi security forces after 2011. The Strategic Framework Agreement, signed by U.S. and Iraqi representatives in 2008, notes that security and defense cooperation shall be undertaken "on the withdrawal of United States forces from Iraq and the organization of their activities during their temporary presence in Iraq." Adm. Mike Mullen, the chairman of the U.S. Joint Chiefs of Staff, said Monday the decision about whether U.S. forces are to remain after December 31 needed to be made without delay. "The point is we're at a deadline, and we need an answer," he told reporters. About 44,000 U.S. troops remain in Iraq through the end of the year, down from about 170,000 at the peak of the war that followed the U.S.-led invasion of 2003. The remaining American contingent is scheduled to withdraw by the end of the year -- and attacks on that force have gone up as Iraqi leaders have debated whether to postpone that deadline. Stuart Bowen, the U.S. official overseeing reconstruction efforts, reported Sunday that the country remains "extraordinarily dangerous" and is less safe than it was a year ago. U.S. commanders, including Mullen, have blamed Shiite Muslim militias backed by neighboring Iran for the increased attacks on American troops, 21 of whom have been killed in the past three months. On Sunday, dozens of tribal leaders loyal to al-Sadr set up tents in eastern Baghdad and vowed to battle the "occupiers" if American troops are allowed to remain. Al-Sadr's followers now hold 39 seats in Iraq's 325-seat parliament. His movement emerged as one of the kingmakers in Iraqi politics during the long deadlock that followed the 2010 elections and played a major role in clinching a second term for Iraqi Prime Minister Nuri al-Maliki. In addition, attacks across the country killed 259 people in July and left 453 others wounded, according to figures released Monday by Iraq's Interior Ministry. The figures also showed 22 "terrorists" were killed and 115 others were arrested. Those figures are the second-highest monthly toll in the country this year, slightly behind June's 271 deaths. But they are well below the 535 deaths recorded in July 2010 -- and far below the bloodshed seen at the worst of Iraq's sectarian warfare in 2005 and 2007, when monthly body counts routinely topped 2,000. CNN's Mohammed Tawfeeq contributed to this story.